Wellness - VNA Northwest Inc.
Do you know what a normal blood pressure reading is? Not sure? When was the last time you had a blood pressure screening? 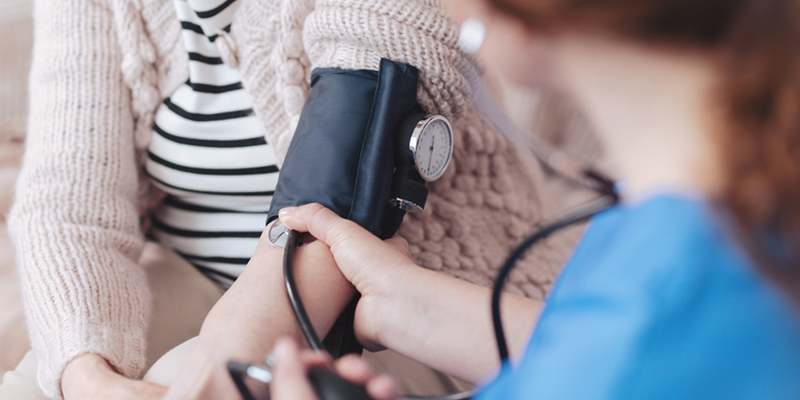 Estimates are that as many as fifty percent of all Americans over the age of 60 suffer from high blood pressure, yet many do not know what their blood pressure is and do not know if it is high or normal. Studies show that high blood pressure leads to heart attacks, strokes, and heart and kidney failure. VNA Northwest offers a regular schedule of blood pressure screenings intended to fight high blood pressure and related ailments. View our calendar for a complete listing of all screening locations and times or contact us for more information. My reading was the best it has been since I started coming – the nurse told me to buy a different brand of sliced turkey because it would have less salt and that’s really made a difference. It usually has no symptoms. You can have it for years without knowing it. During this time, though, it can damage your body. Blood pressure numbers include systolic and diastolic pressures. Systolic blood pressure is the pressure when the heart beats while pumping blood. Diastolic blood pressure is the pressure when the heart is at rest between beats. The table below shows normal numbers for adults. It also shows which numbers put you at greater risk for health problems. One of the great hazards of aging is the danger of falling, even when traversing the familiar territory around the home. Health care professionals know that muscle strengthening, balance exercises, proper movement and stretch techniques can greatly reduce the possibility of falls and lead to a happier, healthier aging process. 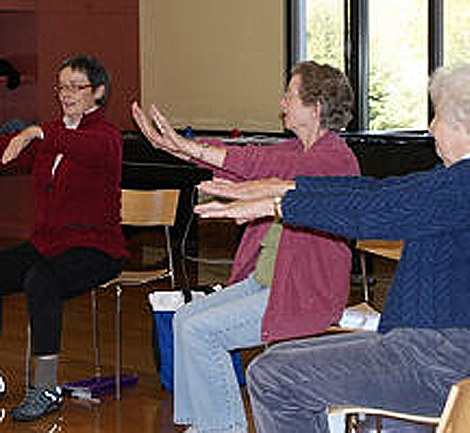 VNA Northwest offers several programs to assist with better balance. The following is a list of programs currently being offered. During this program a therapist will describe various risk facrtors that can lead to a fall and will explain and demonstrate some safety measures and tools that individuals can use to protect themselves from accident or injury. Following the presentation there will be an opportunity for participants to receive personal reviews of their medications and blood pressure checks by a nurse, as well as the opportunity for individual fall risk assessments by a therapist. This is a six week program (1 hour per week) that provides gentle exercises designed to assist with better balance. Most of the exercised are done sitting or standing near a chair. The program begins with a personal evaluation by a physical therapist. The baseline data acquired in that assessment is then used to demonstrate the progress of the individual when the program ends. Participants find this a motivation to continue preventive exercises at home using the take home materials distributed during the program. These classes are designed based on the Tai Chi principle and will include warm-ups, Tai Chi movements and discussion. Based on ancient Chinese Tai Chi uses gentle flowing motions to streghten the body, relax the mind and reduce the risk of falls. Classes are held for 12 weeks (two one hour sessions per week) for a total of 24 classes. Consult our calendar for specific locations and times of programs, or contact us at 860-567-6000 for more information. Bend and Stretch is fantastic! The instructor and the music make it very enjoyable. We seniors have a very good time. There is no charge or only a nominal fee for the program. In most cases, it is sponsored by local towns, organizations or grants. No. Participants are asked to wear loose, comfortable clothing. The single best way to protect against the flu is to get vaccinated each year. Yearly flu vaccination should begin in September or October, or as soon as vaccine is available and continue throughout the influenza season. While influenza outbreaks can happen as early as October, most of the time influenza activity peaks in January or later. Flu and pneumonia vaccines will be administered by VNA Northwest nurses during flu season in local towns at publicized flu clinics. VNA Northwest promotes prevention and wellness by offering seasonal flu clinics to our communities. Flu and pneumonia shots are offered to adults 18 and over at many different times, dates, and locations, see our calendar for this information. For the most up-to-date information, please call us at 860.567.6000. I liked the convenience of your walk-in clinic. Influenza is a contagious disease which can be spread by coughing, sneezing, or nasal secretions. Influenza can lead to pneumonia and can be dangerous for people with heart or breathing conditions. Influenza can occur any time from November through May, but most often peaks in January or February. Plan to get your influenza vaccine in October or November if you can. But getting vaccinated in December, January or even later, will still be beneficial. It takes up to 2 weeks for protection to develop after the shot. Protection lasts up to a year.